Centralisation and standardisation ensure that all information on your personnel files is up-to-date, consistent and complete at all times. Costs and time required to copy and transport files are strongly reduced. Multiple data entry and administration of multiple files are abolished. 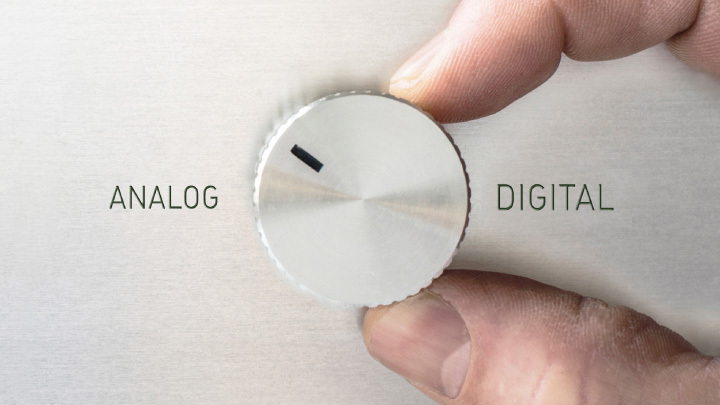 Standardised processes can be automated through sequential controls. Through the company-wide standardisation of processes and their representation within the system process security and transparency are improved. 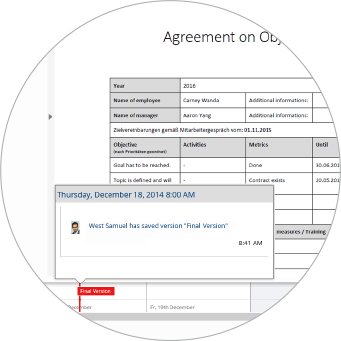 Automated standard workflows reduce routine tasks. Audit-proof long term storage is another important part of the Fabasoft Personnel File. With the intuitive digital personnel file you quickly and easily administer personal documents as well as structured data such as information on marital status in your browser, without the need of any training. 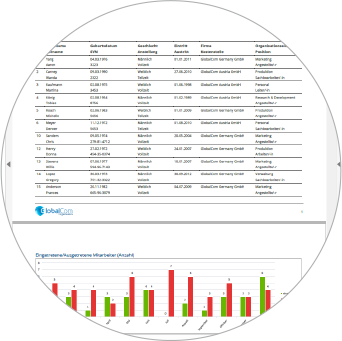 The dashboard displays all important information in a clear manner, including reports and evaluations of your master data. In addition to eliminating multiple data entries and the administration of multiple files, the Fabasoft Personnel File helps you to cut down costs and time associated with making file copies and transporting files. Automation of standard processes further saves recourses. 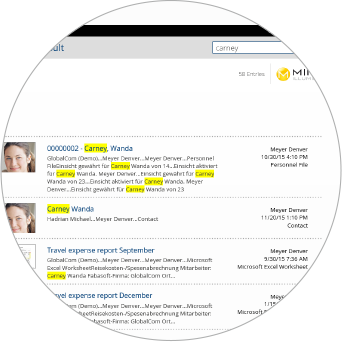 Our semantic search delivers the (personnel) records you need within seconds. The search incorporates not only the name of the personnel file, but also its content which it can analyze semantically (e.g. CV's). 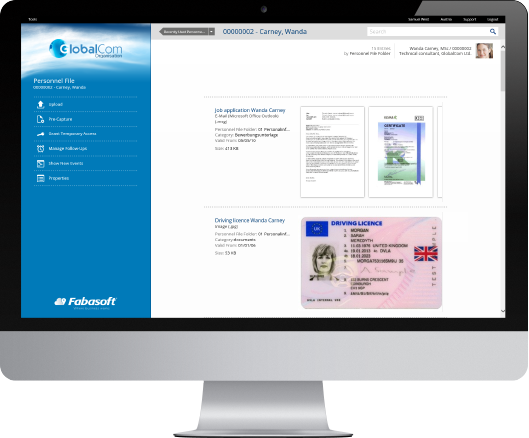 Meet your company’s compliance requirements with the Fabasoft Personnel File. An individually configurable access and authorisation system without any gaps in compliance makes sure that only authorised persons have access to documents and information. The Fabasoft Personnel File enables the audit-proof long term storage of the personnel files of your entire organisation. You can easily and quickly migrate the master data of your employees from existing HR systems and mapping of files. You can also import personnel file documents via CSV format, scanning or drag-and-drop, including file allocation. Due to the existing interfaces, for example, an integration into SAP is quick and fast. The Cloud organisation is a representation of your organisation. Your administrator manages this Cloud organisation as well as the user accounts. Managing the access rights is easy and straightforward: Your HR department can grant access to the personnel files without the need of any particular IT know-how. Advanced reporting options that also use full-text content will dramatically reduce the time required for reporting. You can evaluate your files efficiently according to completely new criteria. Through the use of Mindbreeze technology, semantic searches are at the cutting edge of technology. Efficient finding is not limited to document formats and meta data, but turns data records into “actionable information”. 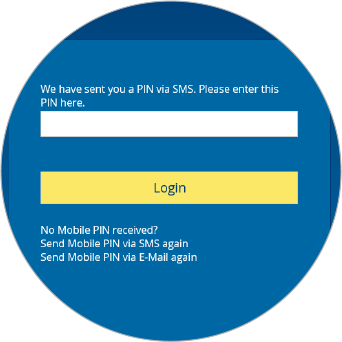 During login to the Fabasoft Personnel File, authentication is always carried out via two factors, for example a text message PIN, an e-mail PIN or a security token (software or hardware token). This procedure creates a protected and trusted working environment. 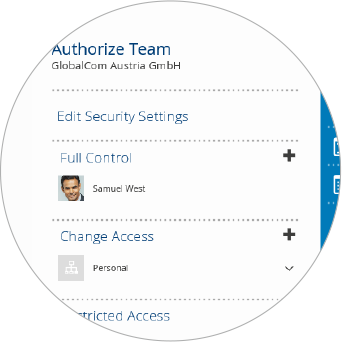 By optimally using the authentication based on certificates it is possible to log on to the Fabasoft Personnel File without the need to enter a login name and password. 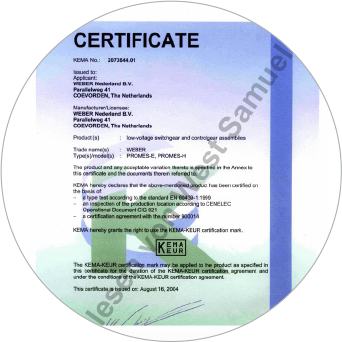 Your administrator can manage your organisation’s certificates and assign names to the user certificates (CN). Each user who has been assigned a CN and holds a certificate can then log on via the login page by using their certificate. The Fabasoft Personnel File ensures continuous versioning, letting you trace each modification of a document. The time travel function allows you to quickly and elegantly view personnel files and/or documents as well as their meta data, which you can compare or recreate if necessary. Every time an object is accessed, the auditing function creates an entry in its logging system. Besides changes to the properties it also indicates when an object was read, and by whom. If required, you can add dynamic watermarks to your documents automatically. So even if a document leaves the secure team room environment, it remains clear and traceable where the document is from and who exported or printed it out. Regardless of their location and across all branch offices and subsidiaries, authorised staff has access to the personnel files any time and in mobile mode. The graphical user interface is not only easy and intuitive to use, but is also designed for people with impairments. Furthermore, the Fabasoft Personnel File is available in 22 different languages. 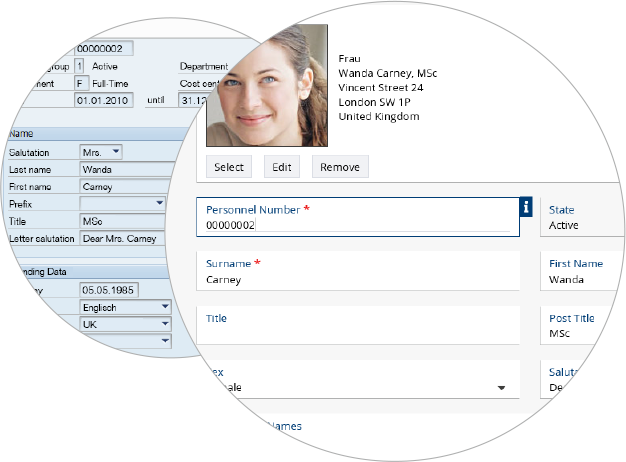 Open interfaces ensure that data and documents are taken over easily, quickly and automatically from existing systems. The company-wide standardisation of processes and their representation within the system ensure transparency as well as a reduced workload. Integrated functions such as representation rules or progress monitoring contribute to greater process reliability. 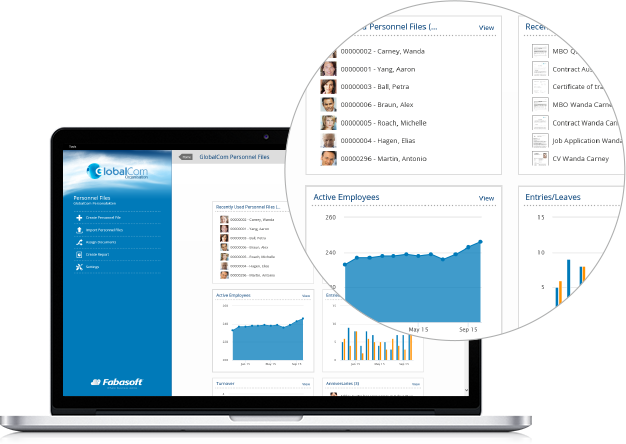 Highly advanced and easy to use search options will help your HR department save a lot of time in its day-to-day work. Data is encrypted according to the secure HTTP standard TLS. In addition, it is stored on encrypted hard disks (self-encrypting disks). The Fabasoft Personnel File can be set up and put into operation by your administrator quickly without the need of any additional programming effort. Setup consists of defining the organisation, adding its members, granting access rights and filing the documents in a structured way. The elegant and intuitive user interface makes it easy to work on personnel files and documents. 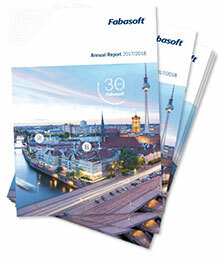 Fabasoft is a European software company developing its products by itself and hosting its infrastructure independently. Since the entire source code is stored in Europe, European autonomy is guaranteed.